If you’re a football fan, this movie is definitely a must-see! The cast is phenomenal and leading it is Jim Caviezel whom you might recognize as the actor who played Jesus in the impactful movie “The Passion of the Christ”. He is such a talented and well-seasoned actor that he really can’t do no wrong in my book. The supporting cast is great as well and they all add quite nicely to the story. This Christian movie is based on a true story of the football team from De La Salle High School. When the Game Stands Tall is about the journey of Bob Ladouceur, a well-known football coach who took on the Spartans of De La Salle High School and helped them have a massive winning streak that broke every record already set. At the beginning of this Christian DVD, the De La Salle High School football team is so close to obtaining their 12th championship. The team wins that championship and some of the seniors from the team encourage those that are starting out to take on leadership roles. Some of those encouraging seniors who are being checked out by college coaches are best friends T.K. Kelly and Cam Colvin. Cam is having a hard time as he had lost his father and was close to probably lose his mother too. One of the things that worry him greatly is that if his mother passes, he’s going to be the primary caregiver for his little brother Jamal. Cam always counts on the support from Coach Lad (played by Jim Caviezel) and T.K. Some of the juniors from When the Game Stands Tall that are going to be leading the team is cornerback Tayshon Lanear but there’s a problem, he’s focused on getting all the glory and doesn’t give the importance to being united with his team. There’s also up and coming running back Chris Ryan who is very close to set a very important touchdown record but back home is dealing with an abusive father who basically lives through his son. Then we have Danny Ladouceur who is actually the coach’s son. This comes with some struggles as well, even though he’s very talented at his position, sometimes he’s out of focuses and misses what they consider easy passes. He desperately wants more attention from his busy dad, especially when they’re off the football field. Soon Coach Lad suffers a heart attack and its when he fully realizes that he’s always been too focused on football than giving his family the importance they deserved. Now that he can’t back to coaching for a while as he recovers, coach Lad wants to reconnect with his son even if it has a rocky start. Also, he’s realized that his marriage to his wife Bev (played by Laura Dern) has suffered as well. Bob Ladouceur is a firm Christian believer so teaching football is his way of preparing young men to become men that can be dependable and contribute to their families and communities when their days of playing football come to an end. Alongside assistant coach Terry Eidson, Lad always has specific values and virtues to say before each practice and game, for example, brotherhood, commitment, faith, and grace, to name a few. He’s constantly encouraging them to play the best that they can and to give their all, not only on the football field but also in their real everyday life. He always let them know that they could always count on him for anything, they were all a brotherhood. Soon a tragedy occurs that impact the team greatly and this event forces the team to think about priorities and to focus on what truly matters in life. Coach Lad reassures his team that family doesn’t necessarily have to be blood relatives, just someone who loves without any doubt. To further inspire his team, Coach lad from the Christian DVD When the Game Stands Tall takes the guys to a Veterans hospital where they speak to wounded soldiers who overcame their situation. A great opportunity for the team to think about their own experiences and a moment for them to be thankful for where they are. 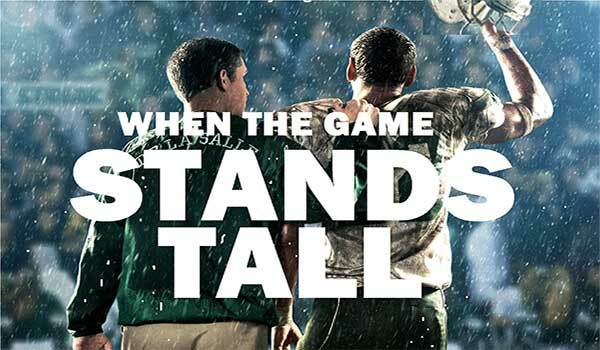 When the Game Stands Tall is a great film about unity and strength. If you’d like to know more about what happens in this Christian movie make sure to purchase it at the Fishflix store.